Brussels Edition: Who Controls the Pot of Money? (Bloomberg) -- Welcome to the Brussels Edition, Bloomberg’s daily briefing on what matters most in the heart of the European Union. As forecasts for the euro area’s largest economies get ever gloomier, finance ministers will wrangle in Bucharest today over a tool that could help struggling members: a joint budget. It’s an important step even if it’s not the bazooka some envisioned, and the battle over who controls the common money pot is expected to be heated. Some countries want governance in the hands of the currency bloc’s 19 member states, while others prefer to use the framework of the EU’s broader budget, potentially limiting its firepower. Finreg Focus | Aside from the budget battle, EU finance ministers will try to agree on priorities in financial regulation for coming years. The need for more integrated capital and banking markets as well as a stronger defense against money laundering will feature prominently in the discussions, according to preparatory documents. Brexit Blues | Ian Forrester, the U.K.’s judge at the EU General Court who has dedicated his life to the bloc and made a name for himself as a top antitrust lawyer, spoke to us about the sore point that is Brexit. Amid all the uncertainty for citizens, the Scot also talked about his worries and the pain he feels for those younger or less advantaged than him. Week Ahead | The EU and China will have the chance to make amends (or not) over a summit in Brussels on Tuesday after a few months of loaded exchanges. On Monday, EU foreign ministers meet in Luxembourg to discuss Venezuela. A European Court of Justice ruling on Polish judicial reforms on Thursday is the other key event to watch, during a week otherwise dominated by Wednesday’s crunch Brexit summit of EU leaders. Dire Data | The Italian Treasury is set to slash its growth forecast for this year and raise its projected budget deficit, according to the draft outlook, which is due for cabinet approval by April 10. The gloomy outlook adds to weakness seen elsewhere in the euro area, with Germany’s painful manufacturing slump showing little sign of ending. Decision Time | Commerzbank CEO Martin Zielke told employees that a deal could help the bank get the scale for necessary investments to pay off. The memo seen by Bloomberg comes as the lender nears a decision on whether to deepen merger talks with Deutsche Bank or break them off. As the two bank lean toward intensifying discussions, there’s mounting opposition to the tie up, with lawmakers across the political spectrum laying into the plans. Tech Scrutiny | The EU’s competition regulator should keep up tough enforcement of big technology firms, according to a report published yesterday by experts hired to guide the watchdog’s future work. The bloc’s antitrust chief Margrethe Vestager told smaller competition authorities in Bucharest that they should take a look at the ideas, which included ordering tech firms to share data as an alternative to breaking them up. Too Close | A secretary of state and an aide stepped down from Portugal’s Socialist government on Thursday amid allegations of nepotism, the first resignations since Prime Minister Antonio Costa was criticized last month over family ties within his government. Eat Your Greens | Don’t feel bad about your pricey avocado toast. But have it on whole grain with a side of fruit, and consider your life lengthened. That’s according to a new study, which says that policies encouraging healthy eating that includes whole grains, fruits and vegetables may have a greater impact on longevity than those limiting unhealthy foods. The Federal Reserve and fellow leading central banks are hitting the pause button when it comes to monetary policy. Faced with slowing global growth and inflation, policy makers are taking to the sidelines or even becoming dovish again. 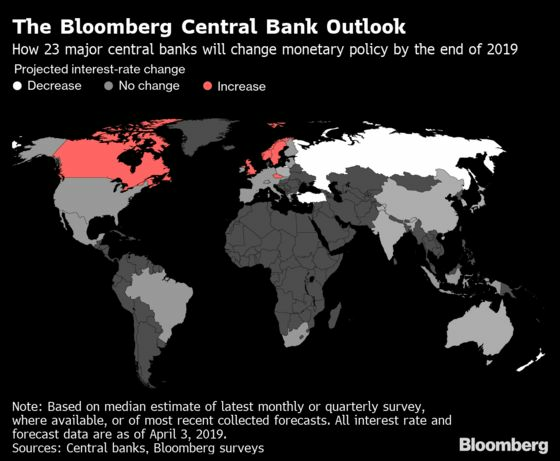 Bloomberg Economics’ quarterly review of 23 of the top central banks around the world showed that most of them are set to hold rates for the rest of the year.